On the left side of the chart is the list of tasks and tasks lists (and all projects in Portfolio Gantt Chart) with their start and end dates. You can double-click on a task in order to have access to its full details. The right side of the chart is where all the action happens. You can see here the duration of each task, represented by the colored segments (and how much time it will take to complete the whole project), who’s responsible for each task and how tasks relate to each other. Above the chart you can find the filters and a few options: the timeline filter allows you to choose how to display the timeline (days, weeks, months or years); the “fit” option will choose the right time filter in order to bring all the tasks in one screen. By default the tasks are displayed in light green (“Create PDI” task). When the task is displayed in red, it’s an indicator that its due date has passed. As you can see in the example above, the “Client meeting” task was due on 10th of January. “Create a list of tasks” – in this case you can see there’s a segment in dark green. That segment represents the amount of hours worked (%) from the total hours budget (for that task). As you can see from the image, the hours worked are ~40-45% from the total. 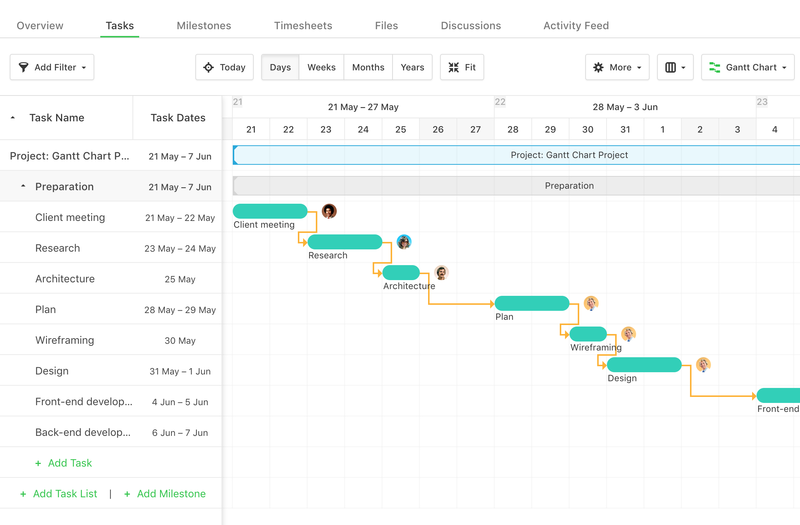 “Gather team and assign tasks” – in this situation you can see there’s a dark green segment and an hachured portion. This indicates that the initial allocated budget hours has been surpassed. From the image you can tell that the budget hours has been surpassed by ~65%. These visual indicators are the same for past due tasks (but colored in red instead of green). The last task in this example (“Wireframing”) is a “completed” task, and it’s easy to identify because its name has strikethrough text. When you create dependencies you can set a gap between two tasks, for example when the first task ends, the second one should start in X number of days. All dependencies that have gaps will become purple, while the ones that don't, will remain orange. If you click on the top right dropdown you can toggle on/off to display the Tasks dates or the task budgets (Worked from total). This way it's clearer if you're over or under budget with your tasks and the specific start and end date of the task.